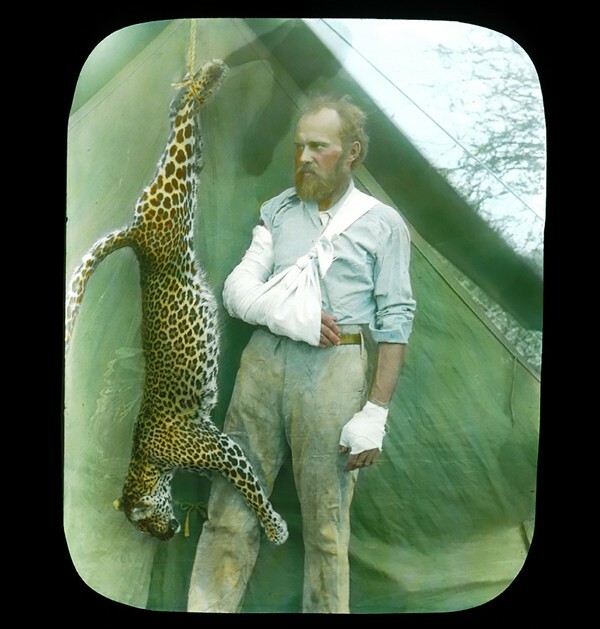 During his first expedition to Africa for the Field Museum, in 1896, Carl Akeley, who would later be recognized as the father of modern taxidermy, collected the skins of more than 500 animals including a lion; impressed a sultan with his taxidermy skill; nearly died of dehydration in the Somali desert until a passing caravan revived him with a skin of rancid goat's milk; and strangled a leopard with his bare hands after the cat pounced, knocked his gun from his hands, and grabbed his arm with its teeth. In short, Carl Akeley was a badass. But for the current purposes of Emily Graslie, the Field's "chief curiosity correspondent" and host of the museum's popular YouTube video series The Brain Scoop, the most significant thing that happened on that trip was that Akeley shot four striped hyenas, which he subsequently mounted and arranged in a diorama upon his return to Chicago. 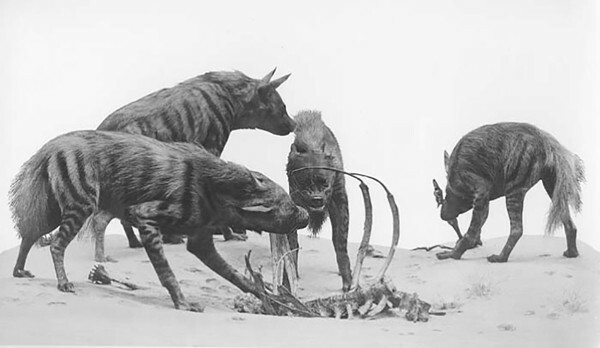 In Akeley's mount, two of the hyenas sniff out the skeleton of some less fortunate beast, while two more investigate the surrounding desert sand for supplements to their dinner. They don't look dead and stuffed, exactly; more like they're in a state of suspended animation and if somebody removed the glass and flipped a switch, they'd go scampering off through the halls of the museum in search of more rotting animal flesh. Currently the hyenas are in the museum's Reptile Hall, where they've languished among the snakes and lizards since sometime after the Field moved to its current location in 1921. Graslie's plan is to relocate them to a more appropriate space: the Asian Hall of Mammals, her favorite in the museum. (Although these particular specimens were from Africa, the world's striped hyena population, which scientists estimate is currently around 10,000, extends across the Middle East into western Asia.) As it happens there's an unused diorama alcove there that's been hidden behind a wall for more than 80 years. Graslie learned about it in fall 2013, early in her tenure at the museum. When she finally excavated it with the help of the museum construction crew, she discovered newspapers from the 1930s. 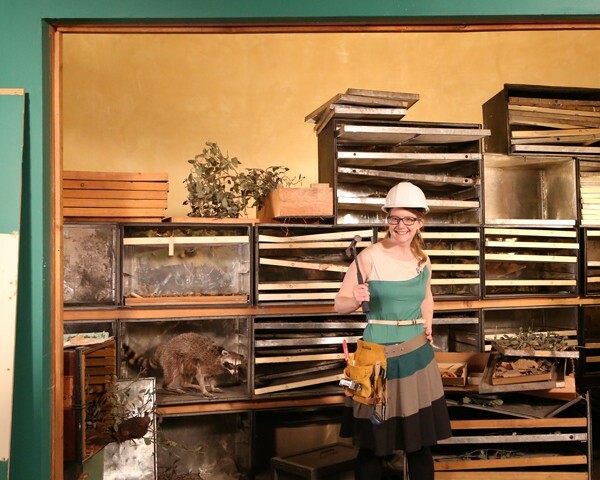 The alcove will be a perfect blank canvas to build a new diorama and in the process educate museumgoers and Brain Scoop fans about the history and function of a natural history museum, and about Akeley and the heroic age of scientific exploration, not to mention striped hyenas. The one catch: Graslie estimates the whole project will cost $170,000. That's enough to support the research of one of the museum's scientists for a full year. So like many other people these days who have a limited budget and a dream, she's turned to the Internet and an Indiegogo campaign. She acknowledges that dioramas are a bit out of fashion, relics of an age before interactive exhibits (and nature documentaries), when looking at dioramas of immobile stuffed animals amid reconstructed scenes of their natural habitats was the closest most people were ever going to get to experiencing these animals in the wild. Akeley was particularly interested in preserving animals that, like striped hyenas, were in danger of extinction. (The impetus for the 1896 expedition was the rinderpest virus, brought to what is now Ethiopia by horses accompanying invading Italian soldiers, which had wiped out 95 percent of the hooved animals in northeastern Africa, the hyenas' main source of food.) He also happened to be a master of his craft. "I'm kind of in the camp of waving the flag of underappreciated people in history [like Akeley] who aren't in textbooks," Graslie says. "Just because dioramas are out of fashion doesn't mean they're irrelevant. It's how we educated people. One of the things that always struck me was the stained glass windows in churches, how they showed some of the most gruesome things. It's because people were illiterate. The way they shared the Bible was through images. Carl Akeley was doing the same thing by re-creating animals." It's true you could go see a striped hyena at the zoo (though there are no hyenas currently in residence at either the Brookfield or Lincoln Park Zoos), but as Nick McCormick, a grad student at UIC who's writing his dissertation on the history of museum displays, points out, "The problem with zoos is that you have to feed animals, clean up after them, and the animal enclosures aren't very realistic. Suspension of disbelief is less important than keeping the animals alive. At the zoo, you wonder, where's the lion? With taxidermy, it's there on demand. For a repeat visitor, it's like seeing an old friend." Emily Graslie inside the unused diorama alcove that’s been hidden behind a wall for more than 80 years. Before Akeley came along, taxidermy was a haphazard profession. Most practitioners kept their methods secret, but it appears that the vast majority stuffed animal skins with straw or sawdust, and the results often bore very little resemblance to living animals. Akeley aspired to a higher degree of realism. He took careful measurements of his animals, then sculpted realistic-looking molds out of clay. He made plaster casts from the molds and lined them with papier-mache and muslin, reinforced with wire. When he broke off the plaster, he had a final form over which he could stretch the animal skin. The effect was strikingly realistic, and because Akeley taught other taxidermists his methods, it's still used today, only with fiberglass instead of papier-mache. Akeley was equally meticulous with the backdrops and landforms in the dioramas. His first wife and assistant, Delia, sculpted thousands of leaves and plants by hand from hot wax and then painted them. "Can you imagine doing that?" Graslie marvels. "That kind of craft and dedication to education?" "Taxidermy is like a language," Graslie says. "If you don't practice, you start to lose the ability to do it. How did they paint the mural? How did they sculpt the land forms?" The Field won't be re-creating Akeley's methods exactly. When Akeley went to Africa, he and his team decided which region they would explore on the ship over and then marched off into the bush regardless of whether they knew where they were going, had sufficient supplies, or spoke the language. (Akeley actually did die on an expedition, in 1926, when he went to what is now Republic of the Congo for the American Museum of Natural History in New York.) Wherever they went, they took hundreds of photos. By contrast, Sarah Crawford, the museum's exhibits coordinator, will research hyena habitats from Chicago, with the aid of Google Earth and Flickr. Once the museum staff decides on a scene—Graslie envisions a desert at night, since hyenas are nocturnal—Crawford will prepare a detailed report for the artists in the museum's replication shop, who will paint backdrops and create landforms and search out other animals, either in the Field's storage areas or purchased from other museums, to appear to interact with the hyenas. The whole process will be documented, naturally, on The Brain Scoop, with a grand unveiling in January. Dioramas, especially dioramas that are meant to last for a long time, do not come cheap. Seventy percent of the Indiegogo campaign's $170,000 budget will go toward construction of the diorama and restoring the stuffed hyenas (in general, they're in good condition, Graslie says, but they're starting to show their age around the ears); the rest will pay for Indiegogo fees, advertising, donation reward perks, and museum operations. "People ask if the dioramas will be animated," Graslie says. "We want to preserve the art form. It's still relevant. No museum in the world has the budget to be so immediate with technology. A permanent exhibit takes so much money and time. We put effort into dioramas for a reason: they have to endure for ages." If the fund-raising campaign goes well, the Field may invest in more dioramas. "It's heavily debated in the exhibits department," Crawford says. "We'd love there to be more. But it depends on how the public responds." For now, though, the museum, and Graslie, are concentrating on hyenas. A set of footprint decals leads from the floor in front of the empty alcove in the Asian Hall of Mammals to the glass enclosure in the Reptile Hall where the hyenas hunch over their skeleton, indifferent to all the fuss on their behalf. Even if the Indiegogo campaign doesn't reach its goal—with ten days to go, it was still more than $95,000 short—the museum will still keep the money it raised and fund-raising efforts will continue. The new Máximo installation and "Antarctic Dinosaurs" exhibit feature dinosaurs from around the world that aren't yet household names, at least in the States. The natural history haven in North Center contains nearly 300,000 specimens that document the biodiversity of the midwest, Illinois, and greater North America. A craving for exotic experiences is changing how museums engage and instruct the public.